Dengeki Online announced today that Dengeki Bunko: Fighting Climax will be receiving an updated release in Japan. The article suggests that this game will be an expansion, much in the same way we typically understand new iterations within the world of fighting games. The new version doesn’t have a formal title as far as we know (I volunteer “Great Advenure! True Dengeki Bunko: Fighting Climaximumering – Revenge to Angel”) but that will likely be announced in the near future, as this release is planned for summer of this year. Currently, this update is only planned for arcades, with no word on PlayStation Vita or PlayStation 3 support. DF:BC hit Japan on those two platforms early last year. To kick off the game’s announcement, Dengeki promised major game balance adjustments and revealed that Emi Yusa from Hataraku! Maou Sama / The Devil is a Part-Timer! will join as a playable character. She’ll be present alongside her franchise compatriot Sadao Maou in this game, though the latter is only an assist character. More characters, and probably stages, are almost certain to come – updating the game with only one character would be unheard of and so much of a hype-killer that no one would do such a thing. DF:BC is a fighting game developed primarily by French Bread and Ecole Software, with developing and publishing assistance from SEGA. It’s designed to be a crossover featuring characters from the Dengeki Bunko light novel publishing umbrella, but it also features a couple of SEGA characters (representing Valkyria Chronicles and Virtua Fighter) and stages themed after SEGA properties. That was probably out of respect for SEGA’s assistance and for fun. 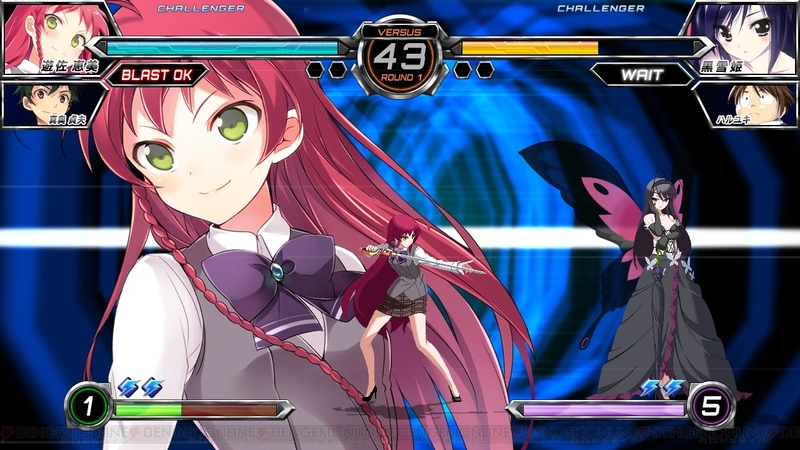 Dengeki Bunko: Fighting Climax is due for release in North America and Europe later this year. It remains to be seen how news of DF:BC’s update will affect any plans for the game’s Western releases or if the additional content will be supported in the West. I feel like it’s probable that the new content will at least appear on Japanese platforms once all new additions are revealed, tested and added on arcades. Depending on the size of the content, the developers may look into offering the new content on PSN. Super Street Fighter IV: Arcade Edition did have a digital purchase option and the game offered minor additional bonus content if it recognized save data from Super Street Fighter IV on the user’s hard drive. When Guilty Gear Xrd hit Japanese arcades, it went through a couple of iterations before the 17 characters now available on the PlayStation 3/PlayStation 4 release were all playable options. Hopefully the developers decide to offer all new content in one package instead of individual packages, as far as my own preferences for handling these situations go.